Pope Bendict XVI just wrapped up a visit to Croatia today. While Catholic reporters emphasized the pontiff's message about the importance of family, a few reporters here and there noted the controversial praising of Cardinal Aloysius Stepinac. Roman Catholics may believe their pontiff is incapable of error on matters religious. He definitely can - and does - err on matters historical. Far from being "manipulated by Hitler for his own ends," the so-called Independent State of Croatia (1941-45) was considered at the time the crowning achievement of Croatians' legitimate aspirations to statehood. That very opinion has been shared by all the governments of modern Croatia, from its independence in 1991 onward. Nor was Cardinal Stepinac a defender of Serbs and Jews, as the Pope alleged, but rather the vicar to Croatia's fuehrer, Ante Pavelic (see note below). The ideology of Pavelic's Ustasha was inseparable from Catholic chauvinism, and its persecution and genocide of Orthodox Serbs was entirely based on religion. One part of the program of pogrom was to coerce into conversion a third of the Serb population - including the children orphaned by Ustasha murders. Catholic clergy not only blessed the Ustasha, but many personally participated in the murdering. Unlike Hitler's murder machine, designed to be impersonal and efficient, the Ustasha took visceral pleasure in their killing - using mallets, knives, pistols and picks. Even the Nazis were disgusted. At the end of the war, with the Communists taking power in Yugoslavia, top Ustasha officials - including Pavelic himself - escaped to Western Europe, the US and Latin America, thanks to the Catholic Church. Stepinac was jailed for five years by the Communist authorities, then held under house arrest until his death in 1960. Given that many in Yugoslavia had been shot for much lesser crimes, Tito's regime was actually exceptionally lenient towards Pavelic's vicar and the Church of Rome. Which, by the way, never offered an apology for mass murder and forced conversions. Or the fact it supported precisely the same scenario for the Serbs in the 1990s. Now comes the ironic twist. Right after the pontiff's visit, Zagreb announced that it will hold a Gay Pride Parade on June 18. The motto of the event is "Tomorrow belongs to us." If that sounds familiar, here's why. UPDATE: (June 8, 2011) Srdja Trifkovic documents Stepinac's wartime record. NOTE: I originally mis-identified Stepinac as Pavelic's personal vicar; he was actually the "Supreme Military Apostolic Vicar" to the Ustasha army, which is arguably even worse. Lawrence Eagleburger passed away today at his estate in Virginia, at age 80. He had been Washington's envoy to Yugoslavia twice, spending seven years in Belgrade altogether. After retiring in 1984, he returned to the State Department in 1989, as James Baker's right hand. Eagleburger was acting Secretary for a while, and actually held the post for just over a month, from December 1992 to January 1993. Today's NY Times obituary claims Eagleburger "was unable to keep Yugoslavia from dissolving" in the early 1990s. Well, here's an interesting question: did he even try? 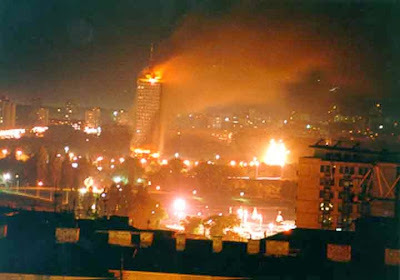 Conventional wisdom has it that the Bush I administration supported Yugoslavia's survival, and only reluctantly changed its mind after "Serbian atrocities". Warren Zimmerman, the last US ambassador to Yugoslavia, claims that Washington supported Yugoslav unity, but not "if it were maintained at the expense of democracy or by force." That was at best facetious (isn't that precisely what Lincoln did? ), at worst disingenuous: in the paragraph preceding that claim, Zimmerman explained the influence of Croatian and Albanian ethnic lobbies, which very much worked towards dismembering Yugoslavia. Washington's official position - paying lip service to Yugoslav unity, openly opposing the use of force to preserve it, and talking about democracy and human rights - amounted to tacit support for the separatists. The NY Times obit quotes Eagleburger's warning to the Serbian president, Slobodan Milosevic, “You can’t hold Yugoslavia together by force.” But the claim that Milosevic tried to do just that is simply not true. It was, in fact, Milosevic who supported the secession of Slovenia and Croatia -though not Croatia's claim to Serb-inhabited territories, at least not without rescinding the clause in Tudjman's new constitution disenfranchising the Serbs - and even tacitly recognized Bosnia-Herzegovina and Macedonia, by creating the Federal Republic of Yugoslavia (consisting of Serbia and Montenegro) in April 1992. None of that mattered to the policymakers in Washington and several European capitals, who by then had decided to designate the Serbs as the principal villain of the Balkans drama, the better to cast themselves as heroes. In 2008, Eagleburger gave an interview to Voice of America, arguing that carving out Kosovo from Serbia set a bad precedent. It was too little, too late - the precedent was already set, back in 1992, when the Badinter Commission decided that Yugoslavia had "dissolved", and Washington went along with this. By 2008, as well, there was a new generation at the State Department, which believed they could shape the world with their willpower, disdaining the "reality-based community" and all that. Still, I'll always wonder whether people like Eagleburger and Zimmerman, with their extensive Balkans experience, could have contributed to things unfolding differently, rather than being accessories to the murder of Yugoslavia. Perhaps some day American historians and media will honestly re-examine their country's role in this sordid episode, rather than dismissing it as "the fault of those evil Serbs" - but I'm not holding my breath. It just occurred to me this morning that I haven't written anything here about last week's arrest of Gen. Ratko Mladic. I've been busy commenting elsewhere - appearing on RT twice so far, writing three articles for the audiences in Serbia, and putting together a column on Mladic for Antiwar.com - and between all that, this particular venue got neglected. I don't think I've seen this kind of venom and hatred, in such amounts, in the media since the Karadzic arrest in 2008. What happened in Bosnia was tragic and horrible enough, it doesn't need embellishment. I understand perfectly why the Muslims, Croats or Albanians would exaggerate or invent Serb atrocities - it's all part of the war effort, and these days, the camera is mightier than the cannon. But what drives American, and especially British reporters to simply make stuff up? Could it be that, without a villain, they - and the governments they shill for - can't posture as heroes? It is outlandish that Mladic is being painted as some sort of Nazi reborn, when his father was killed by the Ustasha (Croatian Nazis) back in WW2, and Mladic himself had been a Yugoslav officer, committed to "brotherhood and unity" and multi-ethnic coexistence, rather than some bigoted nationalist. But perhaps that is the point: by calling Mladic a Nazi, the attention is redirected from his enemies, who had actual Nazi histories and sympathies in the past (one PR flack doing precisely that admitted as much back in 1993). It is also mind-boggling to see Mladic compared to the recently deceased Osama bin Laden, when Mladic actually fought against a government led by a man who wrote a treatise on political Islam and Islamic revolution, whose army actually incorporated several units of Bin Laden's "Afghans", and whose government reportedly issued a passport to Bin Laden himself. Yet even those who fight against militant Islam in Europe and the U.S. instinctively demonize the Serbs, so deep has the propaganda seeped into every pore of the public. I could go on at length about my own wartime experiences (on the receiving end of Mladic's artillery, no less), the hypocrisy of treating the people buried as martyrs in the jihad as unarmed civilians for propaganda purposes, or the specific problems with the definition of genocide employed by the Hague Inquisition - but I've already written much about it all, and don't feel like repeating myself. To me, the most important aspect of this entire affair is that Mladic isn't being put on trial as an individual. The Hague Inquisition seeks to "complete the set" and charge the entire military, political and police leadership of the Serbs, whether in Serbia or elsewhere, with a phantom conspiracy. It has never presented any evidence that this conspiracy existed - but facts and evidence are of no interest to a political court, focused only on creating a villain so its own sponsors can appear noble. For all the good it will do them. This isn't just about Mladic, or the Serbs, or the Balkans Wars. There is a pattern of demonization at work here, with far-ranging implications. The Empire and its satellites are already invoking Mladic as justification for their war in Libya, just as they used Bosnia to justify Kosovo, and Kosovo to justify Iraq. God only knows who might be next.